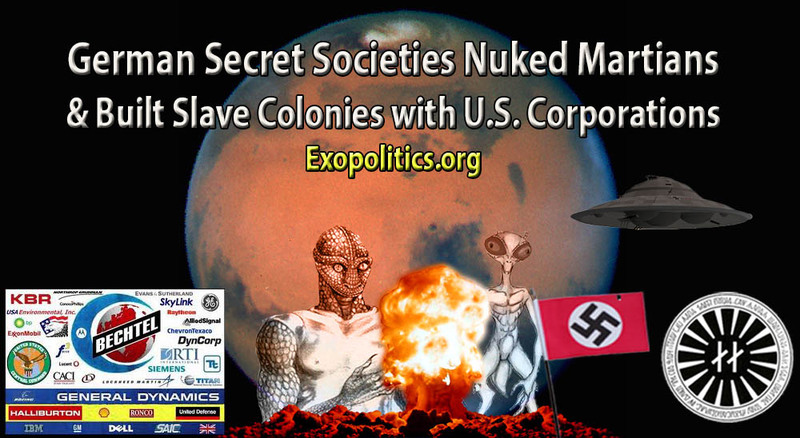 Leading U.S. and international aerospace corporations helped German secret societies build large underground bases on Mars after the Germans had destroyed hundreds of thousands of indigenous Martians using advanced nuclear weapons, according to secret space program whistleblower, Corey Goode. In the latest episode of Cosmic Disclosure with David Wilcock, Goode explained the historical development of the first large Martian colonies that had been created by German secret societies in the 1940s. Goode says that after the German secret societies had reached an agreement with the Truman and Eisenhower administrations, after their 1952 flying saucer flyover of Washington D.C., the Germans enlisted the support of leading U.S. aerospace companies to conduct off-world mining operations and to expand their Martian foothold. Major aerospace companies such as Lockheed Martin, Northrup Grumman, General Dynamics, and Boeing were infiltrated by Nazi scientists brought over by Operation Paperclip according to Goode. These companies began to actively help the German secret societies build their advanced infrastructure for colonies on Mars. Goode claims that U.S. corporations were told about the large deposits of precious metals in the asteroid belt which they could mine after building advanced space craft for the German secret society space program. 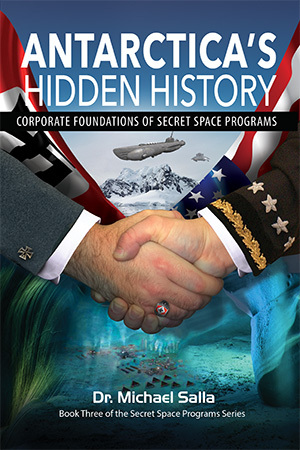 At the same time, the Germans and the U.S. corporations they had infiltrated, gave minimal assistance to the U.S. Navy in building its own secret space program. Goode described three Vril space craft based on ancient Indian Vimana technology given to the U.S. Navy for reverse engineering. He said that while the Navy reverse engineered these older technologies, the Germans forged ahead with the cooperation of U.S. and other international corporations in building much more advanced space craft technologies that were not shared with the U.S. military. Corroboration for Goode’s remarkable claims comes from a former CIA agent interviewed by veteran UFO researcher Linda Moulton Howe. According to the whistleblower, who used the pseudonym “Kewper” in several interviews, he saw two German Vril craft being secretly studied at the highly classified S-4 facility at Area 51 in 1958. At Area 51, the first two craft we saw looked almost identical. They were smaller, not nearly as big as one in the back. Col. Jim mentioned that those two were ‘Vril craft.’ We asked him what ‘Vril’ was. The Col. said it was a foreign saucer built in Germany in the 1920s and 1930s. In addition, Goode’s claims that space mining operations have existed since the 1950s and have involved slave labor, is supported by compelling circumstantial evidence. The British Interplanetary Society had conducted a seminar for leading scientists and futurists discussing the topic of removing a brutal Mars dictator who abused workers. More remarkable is a bill passed by the U.S. Congress that provides language that can be used to protect U.S. corporations involved in space mining from having their operations subjected to government oversight or international investigation. The bill, “H.R.2262 – U.S. Commercial Space Launch Competitiveness Act” was signed into law by President Obama on November 25. Goode further elaborated on the brain drain of the 1950s and 1960s which he says was due to many professionals being secretly recruited to travel to Mars under false pretenses of a futuristic life. The recruited personnel were forced to work under slave labor conditions while being told that the Earth had suffered cataclysmic changes. Laura Magdalene Eisenhower, great grand-daughter of President Eisenhower, claims that a similar offer was made to her and a friend, Ki’ Lia. The both rejected the Mars offer despite great pressure exerted on them to accept. While many aspects of Goode’s above claims have been revealed before in email interviews, reports and in the book, Insiders Reveal Secret Space Programs & Extraterrestrial Alliances, the latest Cosmic Disclosure episode provides additional details and breaks new ground. Goode revealed for the first time that German secret societies had used nuclear weapons on Mars for both excavation purposes and as a weapon against native Martians encountered under the surface. In the preceding episode of Cosmic Disclosure, he described two species of intelligent native Martians, Reptilians and Insectoids, that the Germans encountered. Goode said that hundreds of thousands of Martians, in the various nests discovered by the Germans, were killed in replays of Nagasaki and Hiroshima. The nuclear weapons were a highly advanced generation that did not leave much radioactive residue according to Goode. Wilcock described these types of nuclear weapons as a fifth generation, which are designed to be of low yield and to emit little radioactivity. This makes them suitable for excavating subterranean areas or destroying enemy bases, because they leave the territories usable for building new bases later on. Significantly, Dr. John Brandenburg, who has a Ph.D. in Theoretical Plasma Physics, claims that NASA orbital satellite imagery has confirmed the existence of radioactive isotopes linked to nuclear weapons. The NASA data suggests nuclear detonations on both the surface and atmosphere of Mars at some time. While Brandenburg concluded that the nuclear detonations were likely a result of ancient nuclear war on Mars surface, Goode’s account suggests another, more recent, source. German secret societies used nuclear weapons against Martians in wars of conquest, and NASA’s scientific instruments have detected the aftermath of some of the nuclear carnage. While there is a lack of documentary evidence to confirm Goode’s incredible claims regarding his twenty year service in secret space programs, and more recently as a delegate for a group of extraterrestrials called the Sphere Being Alliance, there is abundant whistleblower and circumstantial evidence (see also here) that help corroborate them. He remains confident that his disclosures are a prelude to massive document dumps by a secret space program alliance, which he is liaising with, that will finally confirm the truth. Evidence available so far suggests Corey Goode’s disclosures are vital to understanding humanity’s real history as a space faring civilization. 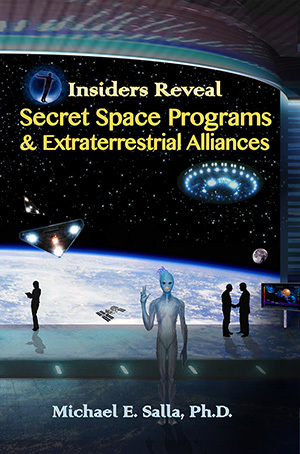 The latest installment of Goode’s Cosmic Disclosure series reveals important information about the formation of a corporate run secret space program involving leading U.S. and international aerospace companies. These corporations gave vital logistical and personnel support to German secret societies who were waging tactical nuclear warfare against the indigenous population, in order to establish slave labor colonies on Mars that the corporations would eventually run.